This is a pineapple actually growing on a plant. I don’t see too many of these in Kansas so I was pretty excited to see pineapples in their natural state. 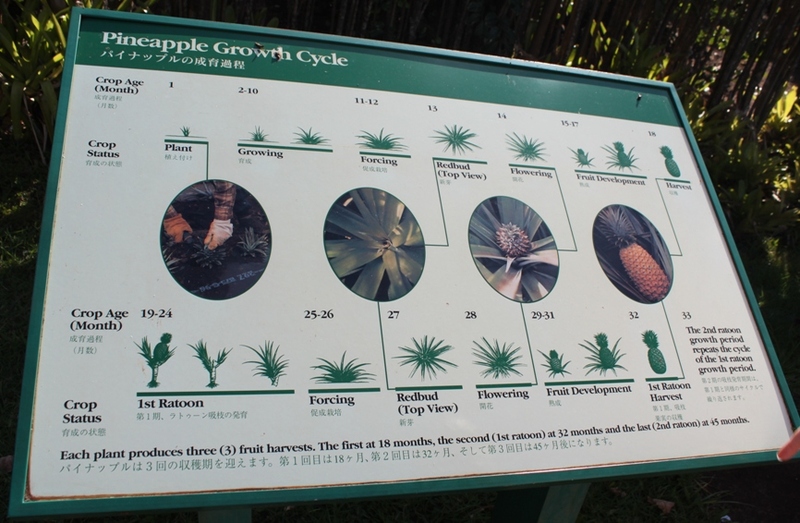 The top row shows the pineapple life cycle for the first 18 months, during the first fruit bearing. 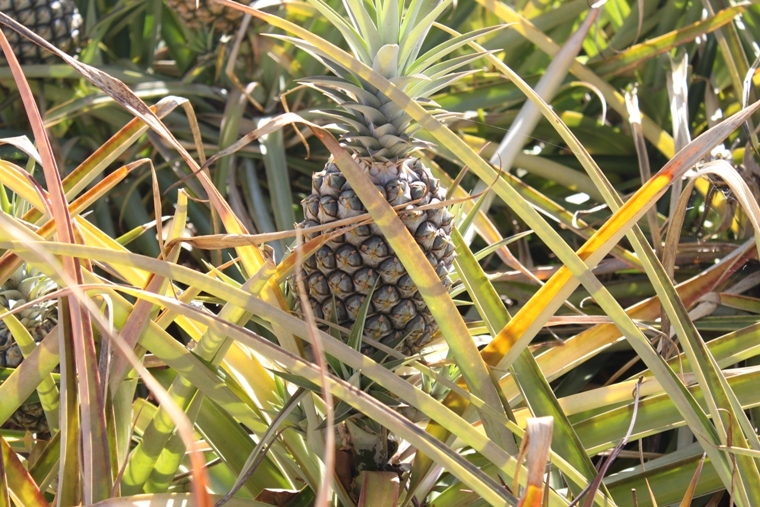 The pineapple grows from the center of the plant. Then the process is repeated but the plant grows a ratoon, which produces the second fruit. Then that process is repeated with a second ratoon and a final third fruit. 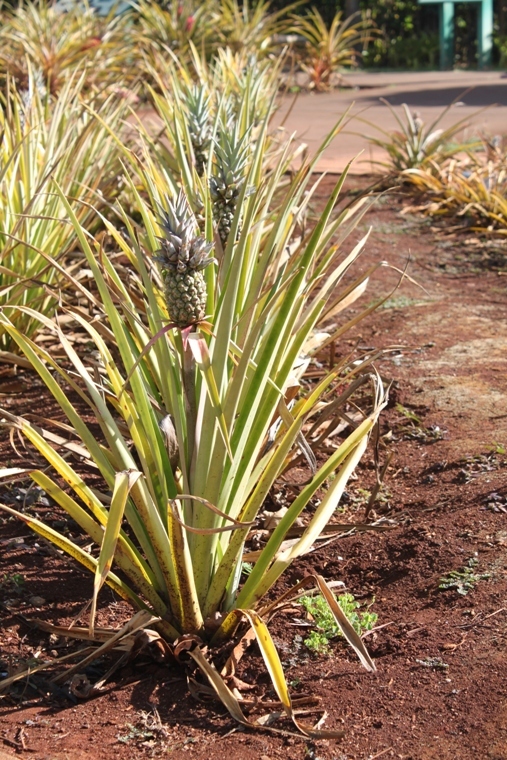 Each plant produces 3 pineapples during its life. You can click on the picture above to see it larger if you want. Can you imagine having that grow in your kitchen garden? 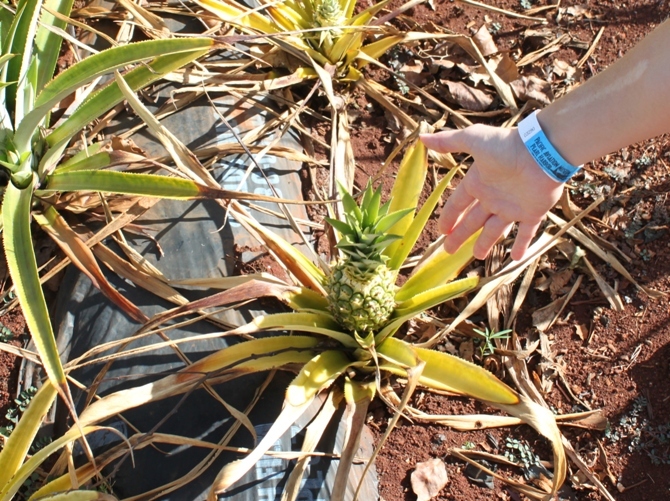 When I went to the farmer’s market on Kauai the farmers had pineapples they had grown themselves! 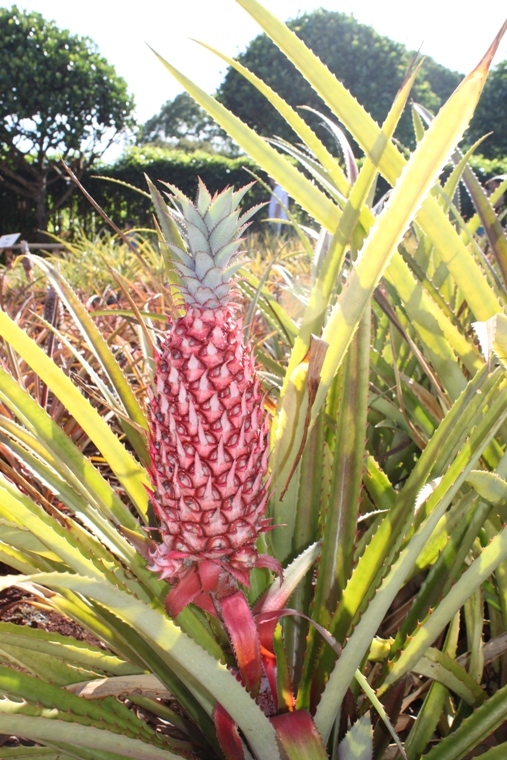 Here is an interesting red pineapple. There are a lot of varieties of pineapple, but only one kind is grown for the U.S. It’s not this one. If I remember correctly, this red one might be popular in the Phillipines. I really enjoyed visiting the Dole Plantation. If you are interested in plants or pineapples I highly recommend it. Unfortunately we didn’t have much time to spend there since we spent most of the day at Pearl Harbor. We only had time to walk around the gardens (which is free) and walk around the gift shop. But there are several other things to do if you have more time. There is a train ride, a garden tour, and the world’s largest maze. There is also a substantial cafe where you can eat lunch and try lots of pineapple-inspired dishes. The gift shop is really big too, but make sure you look at the “made in…” label. I found several things that were not made in Hawaii! So do you like pineapple? If you could grow a pineapple in your backyard, would you? My husband and I went to Hawaii about a year ago and we went to the Dole Plantation. I love pineapple so I thought it was really cool. We even went through the maze and ate in the little cafe. I thought the red pineapples were kind of awesome. Isn’t Hawaii beautiful? Yes! I couldn’t believe how gorgeous the scenery is in Hawaii. Mountains and beaches and gorgeous plants and trees… It’s impossible to capture in a picture! I wonder if we would be as in awe of pineapples if they grew here naturally. Like do Hawaiians wish they could grown corn? Ha. My mother has grown her own pineapples. She takes the tops off the ones she buys, then plants it in the ground. She’s had pretty good luck with it, though we do live in Florida so the weather may be why she has been so successful.